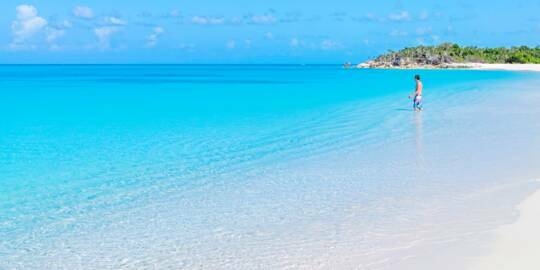 The primary tourism attraction of the Turks and Caicos, our beaches are consistently rated the best in the world. Grace Bay Beach has garnered TripAdvisor’s Best Beach Destination award several years in a row and has also been ranked as the top beach in the world by Conde Nast Traveller. 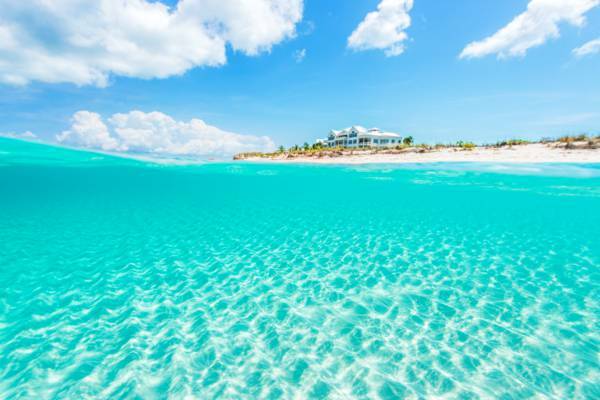 See Why the Turks and Caicos Have the Best Beaches. The wall off French Cay. 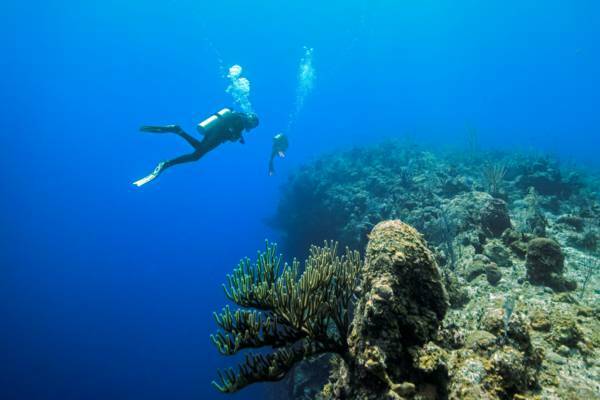 We have the third largest barrier reef in the world and countless spectacular wall dive sites. The Turks and Caicos sits on an underwater plateau that rises 10,000 feet (3000 m) up from the surrounding ocean floor. In many places, the transition from shallow to deep is quite impressive. 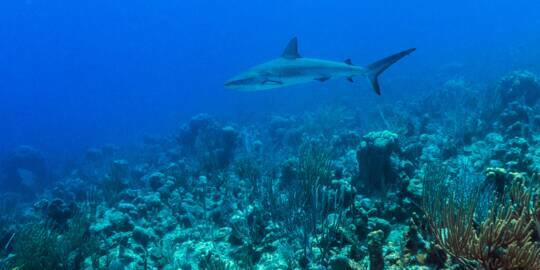 Combined with the abundance of vibrant coral and sea life, it’s no wonder that Scuba Diving Magazine readers have voted the Turks and Caicos as having the best diving in the Caribbean. 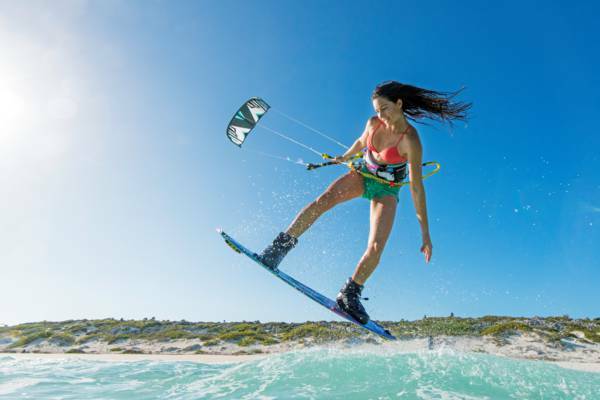 Riding the wind at the unrivalled kite spot of Long Bay Beach on Providenciales. We have great snorkelling, snorkelling, kiteboarding, paddle boarding, parasailing, windsurfing, surfing fishing, boat cruises and more. 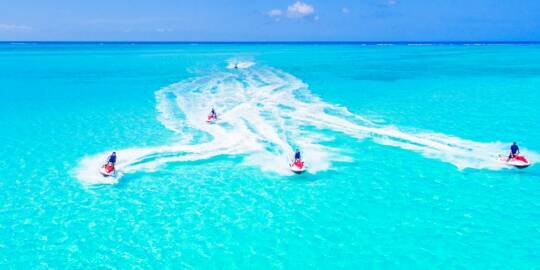 There’s always a great water sport to enjoy in the beautiful marine environment of the Turks and Caicos. Or you could simply relax on Grace Bay Beach. 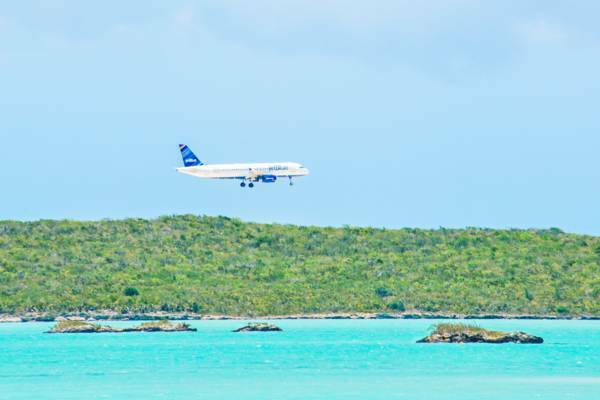 JetBlue over Chalk Sound on the approach to Providenciales Airport. We’re located 1 hour and 9 minutes from Miami, or 2 hours and 36 minutes from New York City by plane. It doesn't get much easier than that. We have direct flights from New York, Miami, Dallas, Atlanta, Houston, Philadelphia, Charlotte, Toronto, and London. Let’s face it. If you have a week off for vacation, do you really want to spend 20 hours and 16 minutes flying from New York to Bali? Or 9 hours and 44 minutes flying from Miami to Honolulu? Oh, and American, UK and EU citizens don't require a visa to visit. 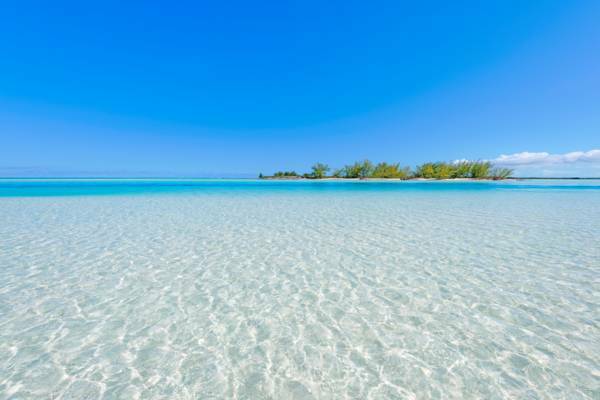 The exquisite water off of Bay Cay, Turks and Caicos. The weather's in the 80f to 90f (27c to 32c) range all year round. We don’t get much rain, and its commonly said that we have 360 days of sun per year on average. Hurricanes tend to pass us on the south (and hit Hispaniola) or pass north (and hit the Bahamas or eastern US). 2015 New Year's Eve. 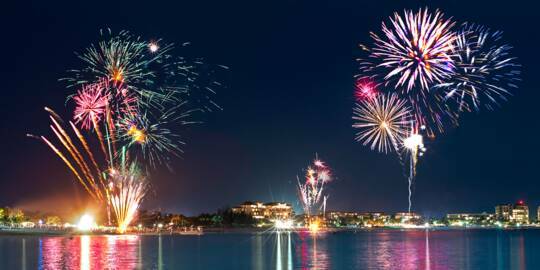 Grace Bay Beach is a spectacular place to watch the fireworks. 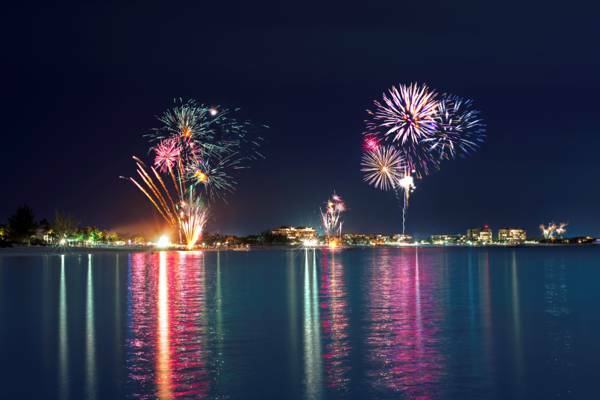 We don’t have the crowds of Nassau or Montego Bay, and that’s not a bad thing. 20 years ago, nobody even knew where the Turks and Caicos was, and the first resort on Providenciales was only built in the 80s. We’re one of the countries where half the people you talk to won’t even know where it is, and 99% would never have been here. Many celebrities own homes here (Bruce Willis, Donna Karan, Keith Richards), got married here (Ben Affleck and Jennifer Garner), honeymooned here (Eva Longoria and Tony Parker, Bruce Willis and Emma Heming). Many enjoy simply vacationing here (Julia Roberts, Tom Cruise, Barbra Streisand, Paul McCartney, Britney Spears, Madonna, Donatella Versace, Greg Norman, Bill Gates, Hugh Jackman, Michael J Fox, Kristen Stewart, Mel Gibson and the list goes on). 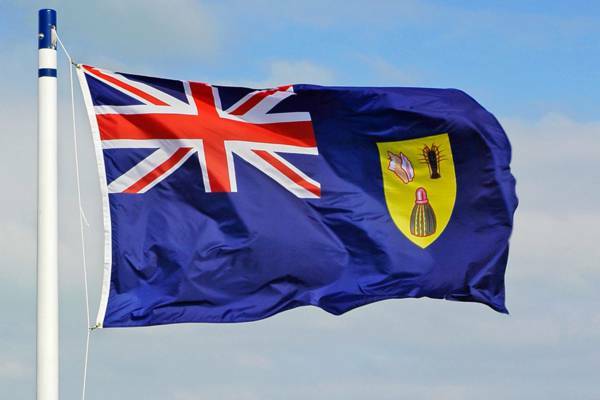 We're a British Overseas Territory with our own culture and heritage. We’re not a third-world banana republic, with a foreign language, weird power sockets and Monopoly® money of dubious value. We have the Union Jack on our flag, we speak English, we use the good ol’ US Dollar, and we have US power outlets and voltages. We've never had a revolution or coup d'etat and we have never assassinated our governors or politicians. 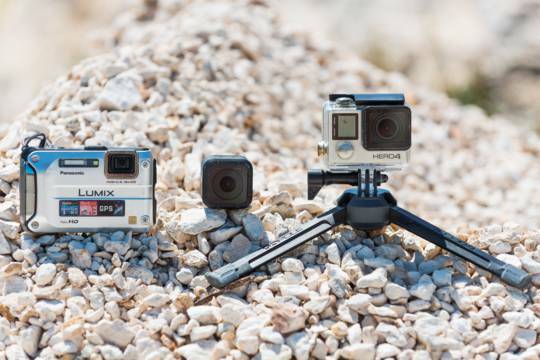 Just one less thing to worry about on your vacation. Wahoo crudo with an edible martini at the Beach House Restaurant. 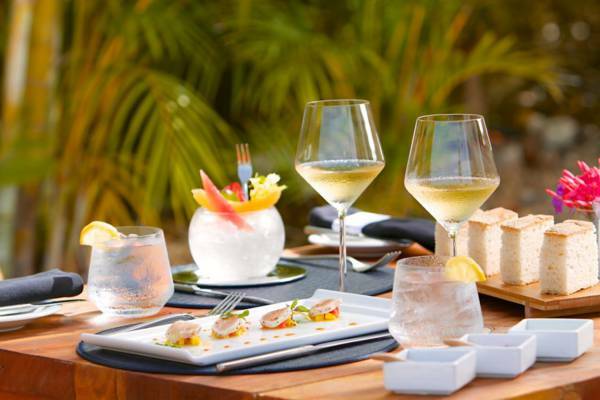 Providenciales is a wonderful destination for fine dining. There’s a wide array of cuisines to tempt your tastes. Locally-caught seafood of course play an important role in many dishes. Why not the Turks and Caicos Islands? We don’t have a big nightlife scene and only one casino (go to Las Vegas). Drugs aren’t legal here (go to Amsterdam). The temperature is on average in the 80’s and we don’t have any winter sports (go to Canada). We don’t have any motels or super-budget accommodation (we can’t beat the US hotel prices, with their system of government-subsidized minimum wage employees). If you’re into culture-shock or slum tourism, the Turks and Caicos Islands isn’t for you. Whereas we certainly have an abundance of poor civil planning and ugly buildings, it’s nothing like the squalor of other parts of the Caribbean, Central America, Africa or Asia. The Turks and Caicos tends to be a very expensive destination. Accommodations, food, and activities tend to be higher here than at other tropical destinations such as Mexico and the Dominican Republic.